Quality takes time. That’s why gravy is slow-simmered on the stove, where ingredients are carefully selected and prepared. Go back in time at this nostalgic 1960's Pizzeria and Pasta Bar accompanied by sounds of accordions and Italian singers. Select seating on bar stools at the pizza oven, in the kitchen, or in a cozy mob-style booth. Uncle Tony’s is open 7 days a week, Monday to Friday for lunch and dinner, Saturday and Sunday dinner only. Go back in time and host your private event at this nostalgic 1960's Pizzeria and Pasta Bar accompanied by sounds of accordions and Italian singers. We offer pre-set and family style group menus, and offer a full restaurant buyout to host fun, and intimate parties for groups up to 45 guests. 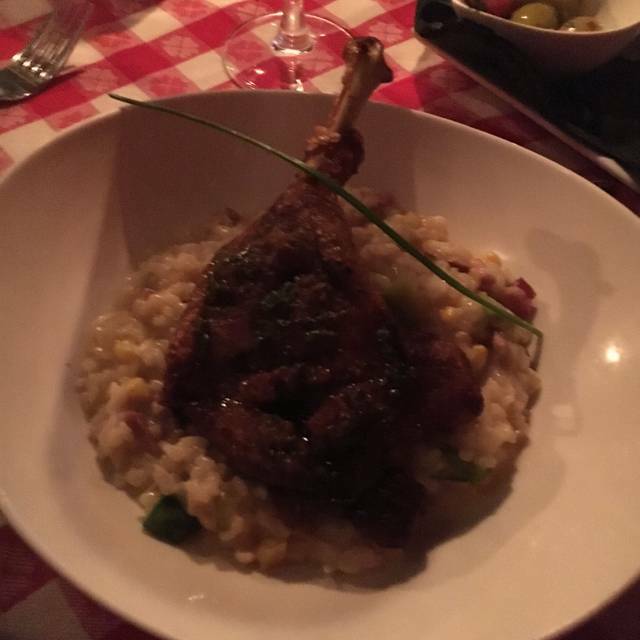 We shared the Caesar salad then had the Chicken Milanese and Risotto. All were prepared very well and were very tasty. We would return next time we need a good meal in the area. Fantastic as usual ! Red checkered table cloth, Chianti candle holders, fabulous service, delicious food and great accordion player and singer of Italian themed music. Like being in Italy , I imagine. Food and service was fantastic. Walked to Sony centre. Will definitely go back, and so would my two friends I was with. The gnocchi were absolutely incredible! We were a table of 3 gals dining before a Sony Centre show and the service was prompt and pleasant. I really wanted to like this restaurant more than I did. At first site the tablecloth was not clean. Not a good first impression. The appetizers were good. The caprese needed more cheese and the tomatos were not fresh. The deep fried cauliflower and pear and arugala salad was good. My spaghetti was ok could use more sauce but meatballs did not taste fresh. 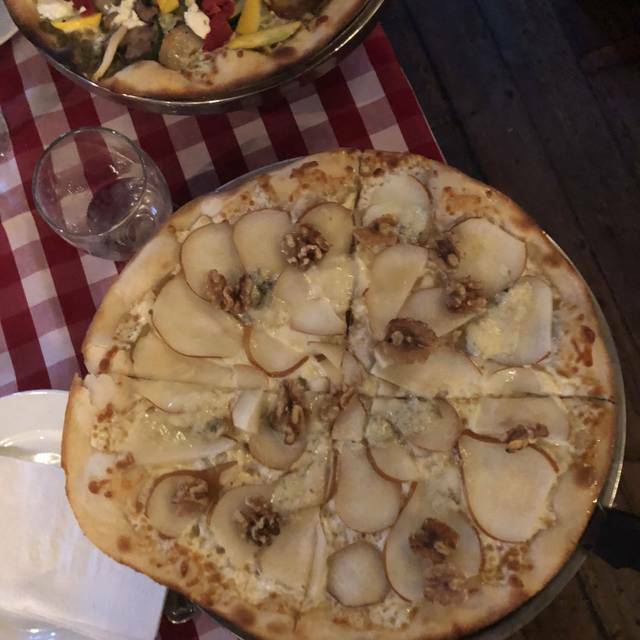 My sister enjoyed her gnochi and my other sister enjoyed her pear and hoeny pizza but the margaritta pizza was not tasty and was very dry. The ambiance was nice and the accordian player was pleasant. We were seated quite close to him so it was a tad loud but not annoying as some other places with loud clients. I'll never understand an Italian restaurant that charges for bread. Come on. I went there with my daughter and we had an awesome dinner! Great wine, pizza, service, ambiance, I have already raved about it on Facebook! Will be going there again soon I hope! Great spot for a downtown dinner before the game. My daughter and I ordered different pizzas and both were fantastic. Clearly they use quality ingredients. Will definitely go back again. Delicious food and tasted very authentic. Great customer service. Our meals were outstanding and the ambiance is old school romantic. Loved it overall! Great place and amazing food as usual! Bianca pizza with chilli oil is the best one I've tried in my life!!! Highly recommend uncle Tonys! Best place to eat on the East end. I love the red booths, as they were very private. I enjoyed the accordion player that came in, and the pizza was amazing. Every year my husband and i go to uncle Tony's for our date anniversary. This year was meant to be special because our son was going to join us. I went in person the day before to confirm the reservation and add a high chair for my infant son. I saw the reservation on the tablet myself and saw the modification. On the day of the reservation we arrived 5 minutes late and our reservation could not be found on the tablet. We also could not be accommodated with a high chair. There's only one in the restaurant! This was very disappointing and we left immediately for a fine meal at a newer establishment down the street. Unfortunately we won't be going to uncle Tony's again. Amazing. Food, service and entertainment were phenomenal! This is a true little gem right in the heart of downtown Toronto. 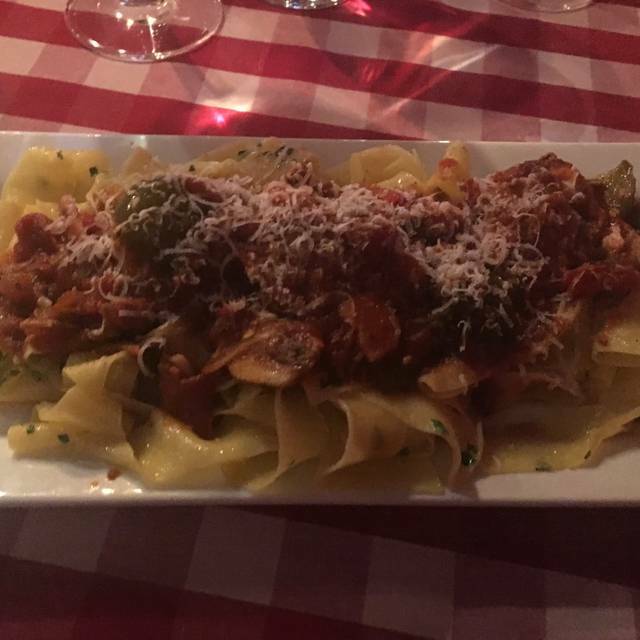 The butternut squash pasta was absolutely gorgeous and the service was excellent - much better value and experience than other more well known options nearby. I will be back! I loved the portion size of the special. it was not too much and just enough which left room for desert, which was also enough. Some places pile it up so high that Never order anything else and never desert. I will come again. And the fresh pasta makes a huge difference. Great food, great staff, great place to spend an evening. Cheers until next time! Cozy little Italian restaurant near St. Lawrence Market. Food and service was good, and it seems very popular. Cute atmosphere, terrible service. Live nearby and had been warned about the service. Arrived for a reso (admittedly a few min late) and was greeted by a very rude server. Table had been given away (although he also did not appear to recognize my name, so I am skeptical that the table was every properly reserved). Instead of telling us politely to wait (we get it, we were late), the server was rude and argumentative. Waited 30 minutes for another table. Food was mediocre. Wine was overpriced. Service was brutal and the food took forever to arrive. It's a shame, because the atmosphere is adorable. But there are other pretty places to eat nearby with better food and decent service. Was completely amazing! Classic Italian atmosphere, food and drink was soo wonderful. Live accordionist ! Would 100% go back or recommend. We live in the neighbourhood and love the food at Uncle Tony's and the service is always good. My only complaint this visit is the door was not closing properly and every time people arrived, the door would not close and a cold breeze (I'm not kidding) would come in and we happened to be sitting by the door. The wait staff would come to the door to close it which seems so unnecessary for them given it was a busy pre-theatre crowd so more often than not, I would get up and close the door because I'd rather be warm. This seems like a no brainer to fix but I had the impression it's an issue that has been ongoing. Please fix the door so we can really enjoy the food. Charming and romantic little restaurant. The old fashioned table clothes adds charm. Food was good. We had a grilled calamari, wasnt the best but it was still tasty. I had butternut squash pasta, was great...then we also had a pizza - was ok.. very very thin - didnt seem like its a pizza!!! The floor space was a little tight, even for a busy downtown spot. This made things generally uncomfortable. Service was great. Ambiance was good (live music was a pro), overall, I’d go back but I’d be ready to squeeze in. Loved everything about this place and the full Italian experience was accentuated by the live accordion player. (Friday night). Service fantastic. Definitely recommend. 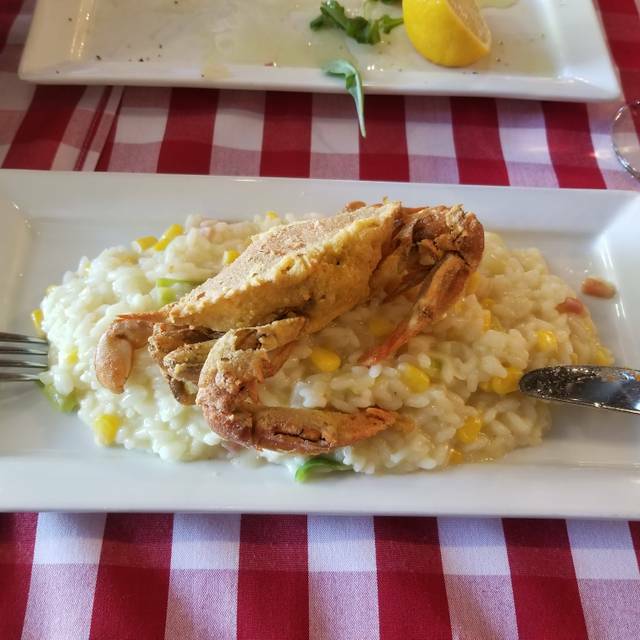 Food could be way better, it was too sweet and not typical Italian taste. But the ambience and service were really good. As always - great food and great service. It’s one of our favourite neighbourhood restaurants. Such a cute spot. Super friendly waitress. Will be back! Overall experience was great...only area found the wine prices out of range. Quaint and quiet with exceptional service and tasty food. Reminds us of the Italian section of New York city with red checkered table clothes and candles stuck in a Chianti bottle usually with a great Italian vocalist. Uncle Tony’s is a great spot for a large group. The food, service and ambiance are all excellent. 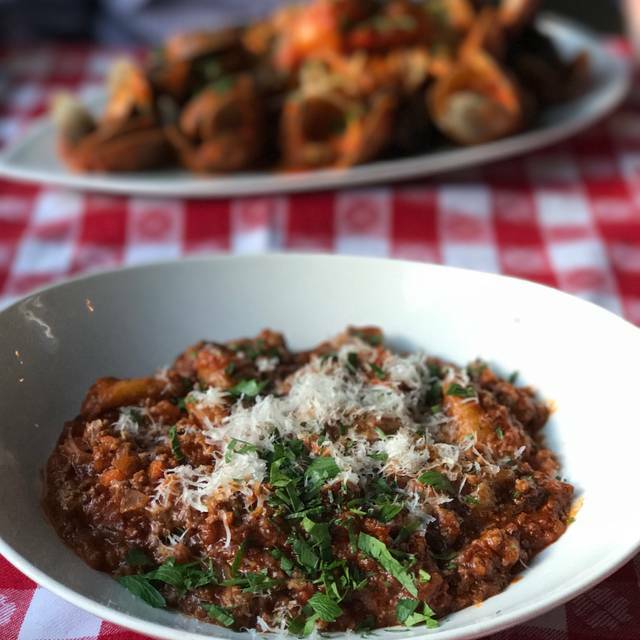 Order up a bunch of appetizers, pizzas and pastas for the table to share, family style. Lindsay was a great waitress who was there when we needed her, with a smile. The accordion music was also a nice touch. We’ll be back with the famiglia! I understand the time i visited was a busy one, but even then i thought the service was very poor. Food and service is always great ,love the pizza just wish pasta dishes portions a little bigger. Nice Italian food. Didn't like the TV screens broadcasting hockey. Reminded me of a sports bar. Takes awAy from enjoying a nice meal. Great spot pre show. We took our teens and they enjoyed the comfortable atmosphere and pasta. Great place! We took the family after distillery. Better than waiting in line! Traditional Italian ambiance. Pizza and pasta was outstanding. Love every visit to Uncle Tony’s. My only gripe is that it would be nice if they had the TVs off unless there’s a really big game on. It definitely spoils the traditional Italian vibe. This is a great place. Amazing atmosphere. Order the crab cakes best in Toronto.